Elliotts, the South’s largest independent supplier of building products to the trade and public, today announced the winner of its 2016 Schools Competition. Inspired by the launch of Elliotts Living Spaces, a collection of quality kitchens, bathrooms, landscaping, flooring and finishing touches for the home, Elliotts challenged school children in years three and four to design an outdoor living space for their school grounds. Paul Cleary, Sales Director at Elliotts said, ”We were thrilled by the high number and standard of the entries we received. I am delighted to announce Fordingbridge Junior School as the winner, with an excellent design that beat off some brilliant entries from schools all over the south of England. 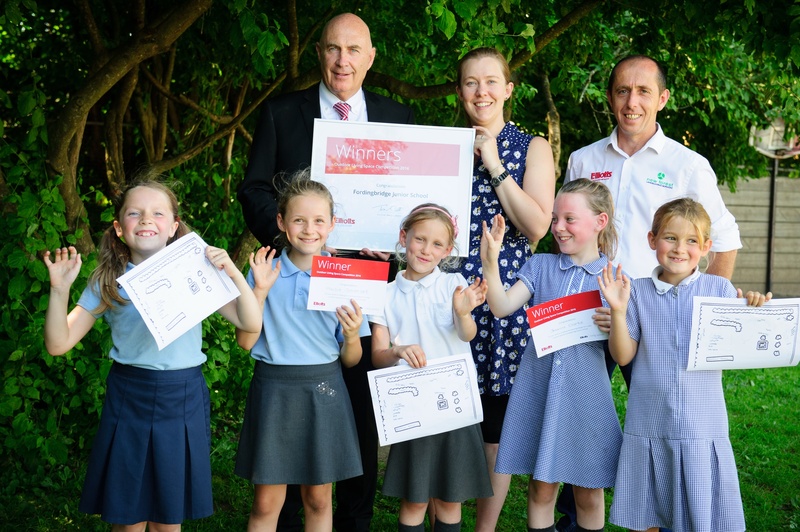 “Our prize to the school is up to £5000 worth of materials to build their new outdoor area, as well as the help and expertise of New Forest Landscaping and Elliotts. We are all very excited about the project and can’t wait to roll up our sleeves and get going. Schools who entered the competition were asked to submit a design showing how they would like Elliotts to help transform a patch of land on their site, with a written appeal stating why the new area would make all the difference to their school. Fordingbridge Junior School’s winning entry described and visualised how their piece of ground could be transformed to benefit all their classmates, including those with additional needs. The small team of budding designers consulted with one of their classmates, Gabi, who is blind and a wheelchair user. Together, they came up with a plan to transform the break time experience for all children. Ideas included a sensory pathway with textures, musical instruments and bumps in the path and beds filled with herbs and fragrant plants. The project is now in its planning stage and Elliotts and New Forest Landscaping are developing the design together to fit the brief. Katie Card, year three teacher at Fordingbridge Junior School said; “It’s been a great year for us, we did extremely well in our Ofsted report and now we’ve won this too. Alex Webster, managing director of New Forest Landscaping said, “We’re really excited to be involved with a project like this. We always enjoy working in the community, and it’s things like this that make me love my job”.